Hairless Khala found wandering in Peru at an Inca ruin site. 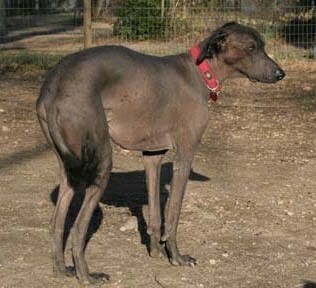 There are two types of Hairless Khalas: the Hairless Khala Medio (short legged, also called the pottery type) and the Hairless Khala Grande (long legged or sighthound type.) The Medio is a medium-sized hound, powerful yet graceful. 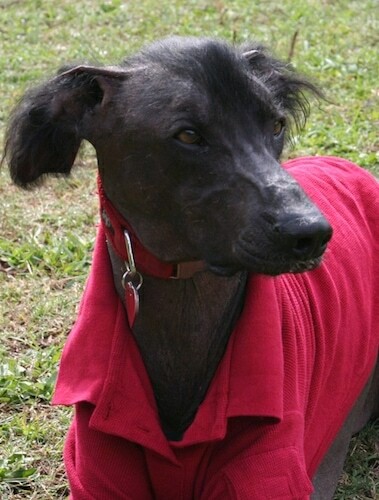 The Grande gives the impression of a sighthound, well-coordinated and able to move with ease and agility. Color is immaterial, but most Khalas are a dark gray at maturity. Loving and docile with family and friends, Hairless Khalas can be aloof, standoffish, even unfriendly with strangers, so socialize them well. They are tolerant and packish with household animals. Owners need to display gentle but firm authority over the dog. With the proper leadership they will accept other dogs. They tend to walk (or run away) from a serious confrontation, which is good since they don't have hair and adult teeth are usually few and far between. When startled, they freeze...which is great for stacking in the show ring! This is a primitive breed; it needs very little in care BUT requires an owner with dog experience to understand it. Generally, because of the loss of protection provided by hair and good dentition, flight is preferable to fight. 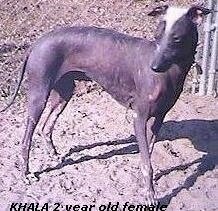 The Khala tends to identify very closely with others of its kind (most hairless dogs do) and is happiest when there are at least two of them in a home. Do not allow this dog to develop Small Dog Syndrome, human induced behaviors where the dog believes he is pack leader to humans. This can cause varying degrees of behavior issues. 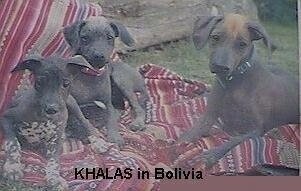 By necessity, Khalas are a naturally healthy breed. In their countries of origin, veterinary care is seldom available or affordable to the Indian peasants the dogs live with. 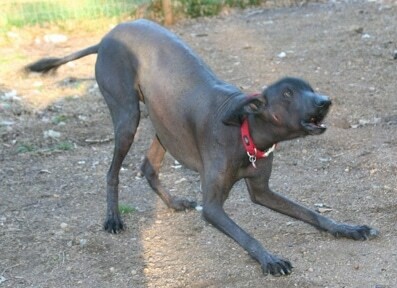 As with most hairless dogs, adult dentition is very bad. The root system is shallow and even puppy teeth are primitive. Coats/sweaters as well as protection from the sun may be necessary, depending on the weather, although little is provided for them in their homelands, where they live from the seaside to high in the mountains. One owner/breeder of the Khala says, "When the temperature is too extreme for them, hot or cold, they let you know! (Each of ours has a complete wardrobe of sweaters and sweatshirts with a different color for each dog; when it's cold out and I pick up a sweater the dog who has that color comes up to get dressed! If I don't go for the dog clothes, one...or all of them...will bring me a sweater and they usually bring their own. They are uncanny...and I'll never again believe that dogs can't see colors!)" A fenced yard is suggested as, being a hound, the Khala tends to give chase without thought. This breed needs to be taken on a daily walk. While out on the walk make sure the dog heels beside or behind the person holding the lead, never in front, as instinct tells a dog the leader leads the way, and that leader needs to be the human. Unknown in the US where they are provided for and protected. An occasional bath. The Khala's nails are described as 'heavy claws somewhat longer than most breeds' and the dogs are very sensitive and resistant to having them trimmed. 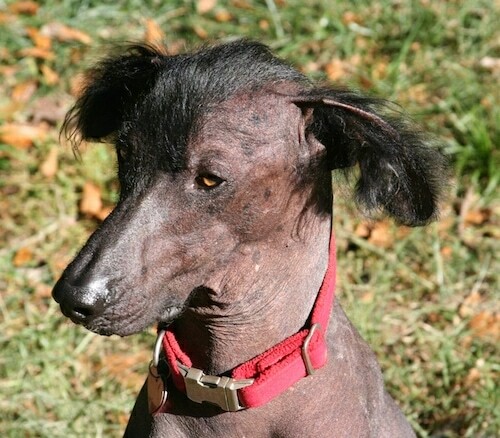 From the American Khala Association standard for the breed: "The hairless hound is indigenous to Latin America from Mexico throughout Central and South America. Almost every Latin country has a variety, whether the medium sized, somewhat heavy bodied 'pottery' type or the taller, leaner 'gazehound' type. The difference between the two is more of substance than of height. Both types can and do appear in the same litter and no attempt has been made, as yet, to breed selectively for one type or the other. The dogs are known by different names, even within the same country. We have only recently classified them simply as Khala, which is the Bolivian Quechua Indian word meaning 'without clothing.' The Peruvian Quechua word for the breed is 'caa allepo,' which translates to 'without vestment.' In other countries, the Indian names translate similarly, which would indicate a difference in dialect rather than in the breed. The Khala is a naturally healthy, hearty animal that survives without pampering from the coastline to high in the Andes. It is a dog of the people and shares their meager existence with affection and a willingness to make do that is common to most unrefined canines. Like their human's family tree, Khala pedigrees are seldom written down and are more of common knowledge and spoken word. It is normal for the entire village to know the names, and a lot more, of any dog's parents, grandparents, and so on for many generations. Some effort is being made in several countries, most notably Argentina, Bolivia and Peru, to track and record pedigree and to exchange breeding animals between geographic locations. Exportation to the US and Europe is limited but not impossible." Hairless Khala Grande found wandering around in the pre-Inca ruins just south of Lima, Peru. Hairless Khala in Bolivia, and yes, the yellow hair is natural. "This is Tigger, affectionately known as "Woo" at home. He is a Khala Grande and is shown here at 8 years old. He is worshipped by our other dogs and we love him dearly. Tigger and his littermates were surrendered to an Atlanta, Georgia shelter at only a few months old." Tigger the Hairless Khala Grande at 8 years old wanting to play. 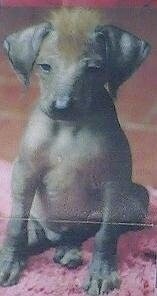 Tigger the Hairless Khala Grande at 8 years old with his red shirt on.